Crackdown 3 feels average, at a time when Microsoft desperately needs exceptional. There’s a reason they call it “Development Hell.” It can’t be pleasant working on a game for four, five, even six years before release, constantly trying to hit a moving target that keeps getting further and further away. 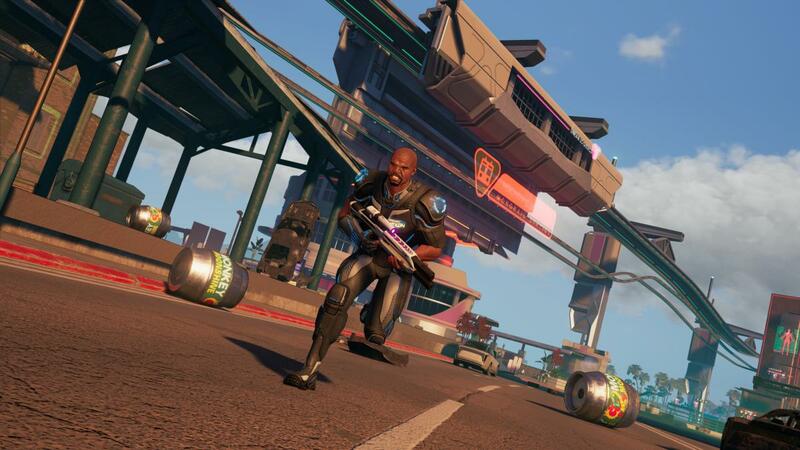 And if there’s any game that embodies development hell in 2019, it’s Crackdown 3. Well, maybe that Final Fantasy VII remake as well, and maybe Shenmue 3, and maybe Dead Island 2, and probably Star Citizen. But I’m here to talk about Crackdown 3, which believe it or not I hadn’t touched until a hands-on demo session last week here in San Francisco. I’m not going to say I had high hopes going into the demo. I didn’t. Even so, what I played is so bare-bones, such a shadow of everything Microsoft ever made it out to be, I’m just not sure what happened here. 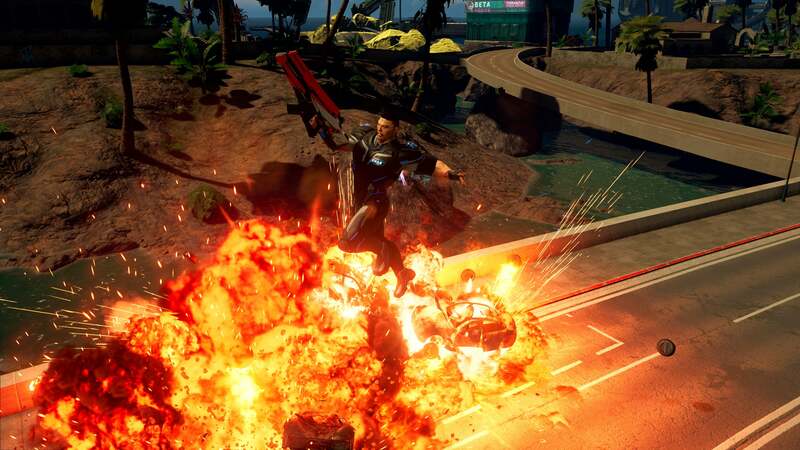 First off, I want to say: I’m not convinced Crackdown 3 will be terrible. It wouldn’t surprise me, per se, but I’m honestly not sure. It won’t be a fantastic game—of that fact, I’m almost positive—but nor does it seem like it’ll go down in history along with the likes of Aliens: Colonial Marines or Mighty No. 9, these infamous disappointments. Crackdown 3 can even border on fun at rare times. There’s still something addictive about the movement in particular. I remember collecting Agility Orbs was my favorite part of the original Crackdown, and that aspect returns here. Starting as a super-cop able to jump two stories, then ending up an even-more-super-cop able to leap over entire buildings is a particularly thrilling feedback loop and I spent a lot of my hour and a half campaign demo just tracking down Agility Orbs again. It felt like I was right back in 2007, playing the Crackdown demo I snagged off Xbox Live—and then replaying it, and replaying it, and replaying it. But it felt like I was back in 2007, full stop. We’ve seen the rise and fall of entire open-world frameworks in the years since Crackdown’s release. The “Ubisoft Formula” of radio towers and infinite map icons dominated for a while, then survival games and Dark Souls-style open worlds, then the less artificial (or at least less intrusive and/or more reactive) model we’ve seen in The Witcher 3, God of War, Far Cry 5, and so on. This last one’s harder to pin down, in part because it means changing how the open world works depending on the game you’re trying to make, as opposed to applying one singular “formula” to every title. Crackdown 3 feels very old. It feels like, well, a game that started development in 2012 or 2013 when a lot of the old open-world ideas were still in vogue. The map is split up into zones, each with a number of icons that feel somewhat meaningless. In one area, you blow up quarry equipment. In another you attack subway robots gone rogue. Do each activity a certain number of times and you’ll unlock a boss fight for the pertinent faction. Take out the boss and you’ll weaken the final endgame boss a bit. It’s the same setup employed by the original Crackdown more than a decade ago, and to its credit nobody’s really duplicated the exact particulars. 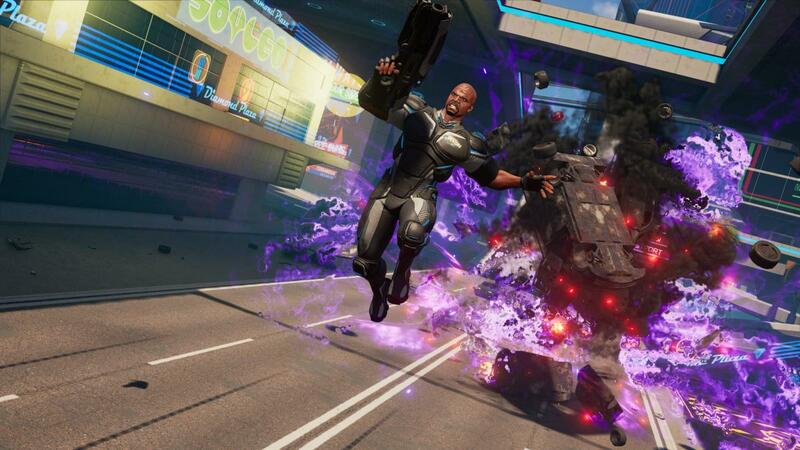 Crackdown 3 is entirely open from the get-go. We were told multiple times that you could start the game and immediately head for the end-boss. You probably won’t get far if you do, but you could, and that separates Crackdown from the actual done-to-death Ubisoft framework circa 2007 to 2016. But that freedom doesn’t change the particulars of the game itself, which is made up of extremely rote tasks repeated ad nauseam. Destroying quarry equipment, for instance, was made up of eight different objectives, at least half of which involved shooting the same weak-points on four copies of the same generic drilling machine. Occasionally the sheer chaos of it all is interesting, but often it’s just tedious. There are footraces. There are vehicle races. There are outpost takedown-type missions. Crackdown 3 lacks any identity of its own, outside of the fact you’re doing these generic open-world tasks as a superpowered police officer. And even that, the game now shares in common with the also-coming-up-on-a-decade-old Saints Row IV. That’s how damn long it’s been since we’ve had a Crackdown game. What makes it all more baffling is going back and looking at how Microsoft’s teased Crackdown 3 over the years. It’s easy to look at Crackdown 3 in 2019, see a game stuck in development hell, see a lot of old ideas stretched over an old framework (but with slightly better graphics) and think it’s always been that way. By next year that dream was dead. 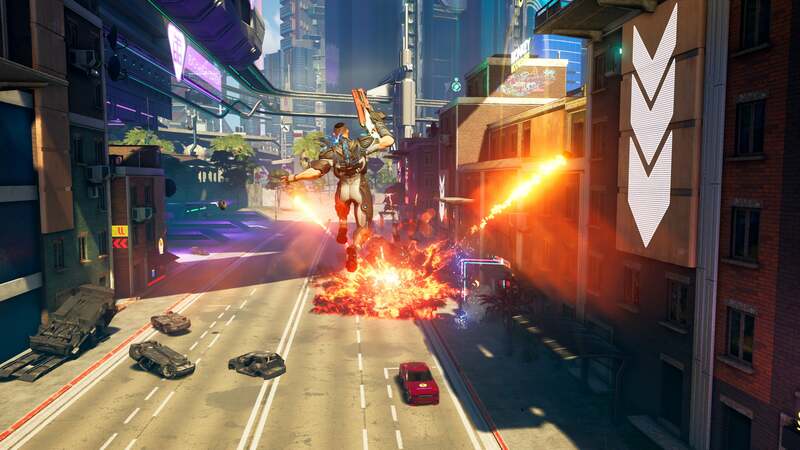 Only Crackdown 3’s multiplayer mode will have this cloud-based destruction tech. We played a bit of the multiplayer. It feels functional, albeit not much different to what I played of Red Faction: Guerrilla a decade ago. And it’s much smaller-scale than the city-spanning destruction Microsoft teased in 2015. Maps feel like decently sized arenas. They are absolutely not entire chunks of city for you to run wild in. Regardless I’m not much interested in a tacked-on multiplayer mode, and I doubt most of Crackdown 3’s players are, technologically impressive or no. The campaign? No cloud-based destruction of any kind. The city is the city. You’re not knocking down buildings, or even chipping walls apart with your powers. It feels rigid, lifeless. There aren’t even many civilians walking around, or traffic to contend with. Compare it to Assassin’s Creed: Origins for instance and Crackdown 3 feels borderline empty. One of my favorite things about first-party games is they get to take risks. They get to iterate on a concept, spend years perfecting the tiniest details, because the publisher (be it Microsoft or Sony or even Nintendo) expects the games to sell hardware, not just software. Crackdown 3 should be that game! It should be this incredible cloud computing tech demo! But it’s not, and without that component the reasons for Crackdown 3’s existence feel tenuous at best. Terry Crews puts in a solid over-the-top performance, from the 5 minute cutscene I saw at the start of our demo. There might be a decently silly story in here, or a few memorable setpieces left to see. It’s fun to jump around in, sure. Microsoft needs more than that, though. It needs more than “An Okay Game.” It needs a God of War, or a Bloodborne, or a Spider-Man. It needs a game that comes up in Game of the Year proceedings, that Microsoft can point to and say “This is why you need an Xbox.” Or even, at the very least, “This is why you should use the Windows 10 store.” It’s doubtful Crackdown 3 meets those criteria, and I just don’t know why. There’s certainly been enough time and money dumped into it, and the question I guess is whether too much time and money were dumped into it. Microsoft cut ties with both Platinum’s Scalebound and Obsidian’s Stormlands this generation. Why did those get the ax but Crackdown 3 kept drawing resources? Until someone writes a tell-all about Microsoft’s behind-the-scenes decisions, I guess we might never know. In any case, Crackdown 3 releases February 15—the same day as both Far Cry: New Dawn and Metro Exodus, as well as Anthem’s “Origin Access Premier” release tier. Tough competition for even the best of games, that’s for sure.